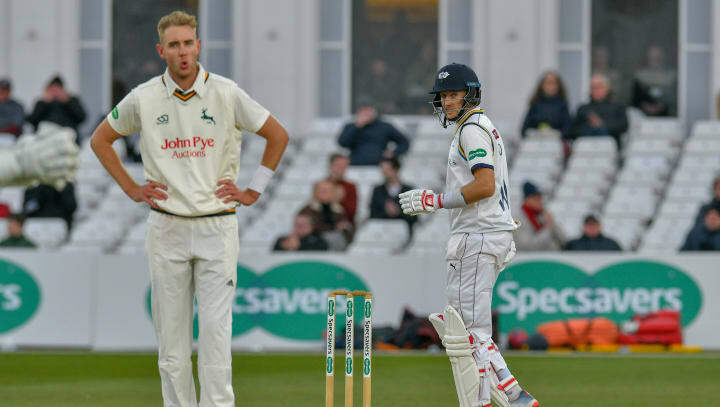 Luke Fletcher and Stuart Broad took two wickets apiece as Joe Root's half-century ensured Nottinghamshire v Yorkshire remains finely poised going into day three of the Specsavers County Championship clash. Root has batted for 166 minutes and faced 110 deliveries so far, with eight boundaries. He was dropped on eight by Chris Nash in the slip cordon from the bowling of Paul Coughlin. The unlucky Coughlin then bravely attempted to dive full length to catch Root’s miscued pull in the deep off Broad. Fletcher, back in action after missing much of the pre-season preparations whilst waiting for the birth of his new daughter, twice hit the bullseye in bowling both Gary Ballance and Jack Leaning; the latter out for a three-ball duck when not playing a shot.